TOTW 22 Predictions are here, and while we may not have the superstar strike force we saw last week, it certainly packs a punch with a host of top names competing over the 23 spots! We kick start our predictions with a big name, a man who recently won the world cup, but has appeared to struggle with his domestic campaign so far this season. Tottenham picked up the points with a 3-1 home win over Leicester this week, allowing them to keep some sort of pressure on the top two in their outside bid at taking the Premier League. Despite conceding, Lloris was in sensational form on the day, pulling off 9 incredible saves including one from the spot. If we do see him missing out though, we wouldn’t be surprised to see a Sanchez inform instead! Over to Italy now, where we find an incredibly tight match between Sampdoria and the visiting Frosinone. With the visitors sitting deep within the relegation zone, a big match was needed here, with 3 points the preferable outcome. Ciofani put them up 1-0 in just the 25th minute, and from this point on it was simply defence, defence, defence. Capuano was at the heart of this system, and he was an absolute rock. He may not have scored, provided an assist or had some fancy clearance off the goal-line, however he did help ensure the clean sheet and is fully deserving of his nomination this week. For those of you who normally read our predictions, you will know that we love a bit of a gamble, and never hesitate to include those more controversial decisions when selecting our lineup. With a match as big as the Madrid derby, it just wouldn’t feel right to not include somebody, especially when Real Madrid picked up the points with a 3-1 away win. Casemiro could make the cut with his goal, and I guess Bale has an incredibly small outside chance of one after scoring from the bench. Our nomination however goes with Ramos, who was fairly solid at the back, provided the assist for the first and found the back of the net from a penalty. The key worry this week is just how recently his man of the match card featured in packs. From one fairly controversial defensive selection to another now, as we move back across to the Premier League where we find Southampton and Cardiff going head to head in a battle towards the bottom of the table. On the day it was Cardiff who secured the points with a 2-1 win, and while Bamba makes the lineup, it isn’t with total confidence. The lack of a clean sheet isn’t ideal, however a goal in such an important match, in a week that lacks defensive options, was just about enough to swing it in his favour, and potentially provide him with a second inform too. Time for the big one now, the highest scoring game to feature within these predictions since I began creating them. Benfica were hosts to Nacional for their Liga Nos clash this week, where they secured the points with a monumental 10-0 win. Now as you can imagine, picking a TOTW nominee here was nothing short of impossible, especially when you can only include the one. Pizzi however was spectacular on the day, scoring once from the spot, providing 3 assists and taking a perfect match rating too. Let’s stay put for this selection, as we move across to the match between Sporting and Feirense. Sporting were on top this week as they picked up the win with a 3-1 away victory. Fernandes was absolutely brilliant in the midfield, scoring twice before being substituted in the 75th minute. A performance like this from a central player has every chance of generating a new Inform. Is it too soon? Is the fact that he recently had a headliner card in packs a sign that he could miss out this week? Possibly, but if these headliner cards can’t receive upgrades from top tier performances now, then there isn’t much time for them to hit any upgrades whatsoever! Manchester United continued their sensational form with a 3-0 away win over the struggling Fulham this week. Pogba was once again fantastic, scoring once from the spot and once from open play to help secure these points. If EA do choose to ignore this performance though, we would expect his national companion Martial to happily fill this void! Galatasaray picked up the points with a fairly straightforward 3-1 win over the visiting Trabzonspor this week. The whole team were fairly solid, despite conceding on the day, however Belhanda was in unbelievable form for the hosts. Not only did he secure a near perfect match rating, but he also scored two of the three goals for the hosts, whilst dominating the midfield and ultimately the match. Over to Germany now, where if back to back informs were possible, we would be seeing a second for Brandt. This isn’t the case however, which leads us looking for an alternative selection from Leverkusen’s 5-1 win over Mainz this week. Bellarabi is the next man on the list, he was nothing short of spectacular on the wing, found the back of the net, provided an assist, and secured a solid match rating too. We think it’s time for a second inform for this man. With the title race in full swing, all eyes were on Manchester City this week as they played hosts to Chelsea. The world was expecting a fairly close match, with Liverpool fans hoping that the visitors could provide an upset of sorts. City however had other plans, and absolutely destroyed Chelsea with a more than comfortable 6-0 win. Aguero was sensational picking up yet another hat-trick, however with his recent inform currently in packs, the selection has to go elsewhere. Luckily we didn’t have to look far though, as Sterling was simply incredible as well. Scoring twice and winning a penalty should be more than enough to see this young Englishman secure yet another special card in FIFA 19. Roma were on the road this week as they travelled to Chievo for their Friday night fixture. It was all one way traffic on the night, as the visitors stormed to a 3-0 win, taking all the points and creating plenty of nominations for a spot in this weeks lineup. For us however, Dzeko has to be the man to take this spot. Scoring a perfect 10.0 rating, he hardly put a foot wrong across the 90 minutes, scoring once and assisting a second to claim the man of the match award, alongside his spot in this starting eleven. Onto the bench now, and despite a top draw performance from Ter Stegen, it’s Italy that we are heading to next. Torino were 1-0 winners over Udinese this week, however the result wasn’t all smooth sailing. Sirigu pulled off some brilliant saves across the match, including one from the spot, to not only secure the clean sheet, but also all the points for his club. Holland is our next destination this week where we find Feyenoord pulling off a simple 4-0 win over the visiting De Graafschap. 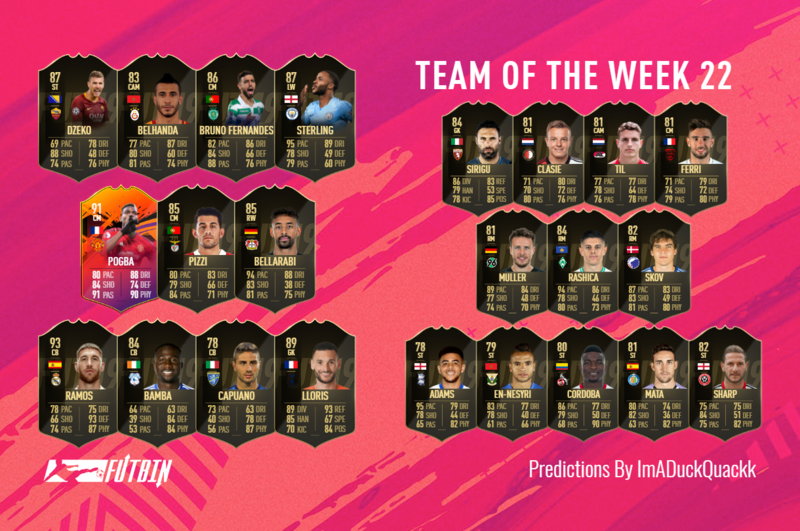 Now this time we could literally pick any player who made the starting eleven and justify it, and with the lack of defenders present in this week’s predictions, I wouldn’t be shocked to see EA select a fullback with a goal and a clean sheet each. We however, have gone with Clasie, how provided two assists and secured a near perfect match rating. Over to France now, and this is where things get a little more difficult. We all know that EA loves to include diversity when it comes to their selections, and this often means a couple of players from each of the bigger leagues. This week however picking a standout performance from Ligue 1 was tough, with a single goal looking likely to make the squad. Our nomination goes with Ferri and his goal, during Nimes 4-2 win over Nantes this week. It was a great week for Bundesliga wingers, as we see our third wide player included within this 23 man squad. Werder Bremen breezed past Augsburg this week with a dominating 4-0 win. Rashica was in great form on the day, scoring twice and with it, possibly securing his second Inform of the season. Over to the Danish Superliga now, where Kobenhavn continued their dominating season with a 6-1 win over OB this week. Skov was once again the man of the hour, putting in a fantastic performance and securing 2 goals before the 90th minute. He wasn’t done there though, as a penalty deep into stoppage time ensured he finished his hat-trick, took the match ball, and possibly a second Inform too. AZ Alkmaar were away to NAC Breda for their Eredivisie clash this week, in a game that provided fans with 3 goals. These goals were not split amongst the teams, and it was the visitors who took the points after scoring all three themselves. Til was an absolute monster in the midfield, dominating the play, commanding the midfield, and locking down the hosts, all while managing to find the back of the net not once, but twice himself. From a central midfielder, 2 goals is usually enough to secure a spot amongst the elite, surely this week will be no different. Flying back to Germany next, where Hannover played hosts to Nuernberg in their Bundesliga fixture this week.The game itself was incredibly one sided, with the guests managing just a single shot on target across the 90 minutes. Hannover however were extremely dominant, with one man in particular shining like a star. Muller was the man behind both the goals in this match, terrorising the opposition, and comfortably taking the man of the match award too. Friday provided Championship fans with an incredible match and a result that not even the most seasoned professionals could have predicted. Sheffield United were away to Aston Villa for this match, and after 66 minutes Sharp had managed to put the visitors 3-0 up. Jump forward and with 81 minutes gone, the score remained the same, however the hosts had a couple of tricks up their sleeves. With goals in the 82nd, 86th and 94th, they somehow managed to scrape a point from the game, leaving the visitors baffled and demoralised. After providing his hat-trick there wasn’t really much else Sharp could do though, and to not include him due to the backline crumbling would be nothing short of a crime. Back across to the La Liga now, where Getafe brushed aside the visiting Celta Vigo with a fantastic 3-1 victory on Saturday. Mata was absolutely magnificent on the day, playing a part in each and every goal for his side, while comfortably securing the man of the match award along the way. Scoring one from the spot, one from open play and providing the assist for the third should be more than enough, and hopefully we see him rewarded with his first inform of the campaign so far. There are plenty of high flying teams that have had numerous informs so far this year, however these teams often originate from bigger leagues, where the demand is fairly excessive. Cologne are a prime example of a team that breaks this mold, and after their relegation to Bundesliga 2 last year, it looks like they are on track to bounce back with style too. This week they took the points with a 4-1 home win over St Pauli. Cordoba was the man of the hour this time, scoring not once, not twice, but three times, to wrap up both his hat-trick and his spot in our predictions. We travel back across to Spain now where Leganes brushed aside the visiting Real Betis with a comfortable 3-0 home victory on Sunday. The team put in a solid performance across the 90 minutes, however one man was the runaway winner when it came to completing our predictions this week. En-Nesyri was near perfect across the match, scoring each and every goal for the hosts, and fully deserves this spot amongst the elite. We move onto our final selection of the week, and with it we find our second player to feature from the Championship, along with our second hat-trick from the league too. Saturdays fixture between QPR and Birmingham provided fans with drama from start to finish. Birmingham rushed to a 4-0 lead in the first half, with the home fans already heading for the exit. The second half however saw a complete switch in momentum, with the hosts pulling the game back to 4-3, but sadly they missed a very late penalty, and just couldn’t seem to find a fourth. Adams was the hero on the day, the man who put Birmingham into their early lead, and with three goals to his name is fully deserving of his spot this week.